Preheat the oven to 350 degrees F (175 degrees C). Lightly coat a 9×13 inch baking dish with extra virgin coconut oil cooking spray. Season the tilapia fillets with salt, pepper and Cajun seasoning on both sides. Arrange the seasoned fillets in a single layer in the baking dish. Place a layer of lemon slices over the fish fillets. I usually use about 2 slices on each piece so that it covers most of the surface of the fish. Bake uncovered for 15 to 20 minutes in the preheated oven, or until fish flakes easily with a fork. 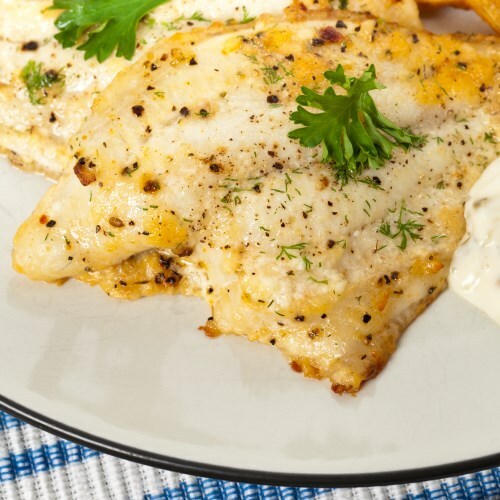 While the fish is baking, mix together the mayonnaise, sour cream, garlic powder, lemon juice and dill in a small bowl. Serve with tilapia.